Keanu Reeves is back in as the remorseful assassin John Wick and the curiosity is rounding the across the quarters. John Wick: Chapter 3 – Parabellum is all set to hit the theatres in India on May 17. The latest poster of the film is released today and is giving away the trippy feels of witnessing the actor as the killer. Chad Stahelski’s directorial venture will be high on action and the thriller stars Halle Berry opposite to Reeves. Keanu Reeves Recalls Being Blacklisted by Fox Studios for Turning Down ‘Speed 2’. 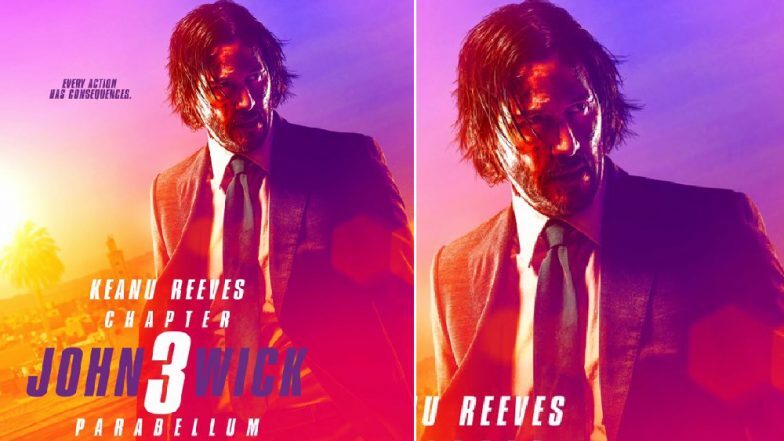 The movie will start its journey in the immediate aftermath of John Wick 2, with Wick excommunicated and on the run, having to defend himself against a host of equally skilled assassins looking to scoop up the bounty for killing him. Ram Navami Special: Keanu Reeves As Lord Ram, Salman Khan As Hanuman, Shilpa Shetty As Sita – Did You Know Such a Movie Based on Ramayana Was Once Planned? The movie also stars Angelica Huston, Asia Kate Dillon and Jerome Flynn in pivotal roles. The film is being brought to India by PVR Pictures, read a statement.